Indeed, after years of working as a back-up singer for Kirk Franklin, Vicki Winans, and Angie Stone, and a third place finish on Season Five of BET’s Sunday Best, Moore earned a record deal with the Tyscot label in 2013. Light in the Dark—her first album as a solo gospel artist—shows that Moore’s prior experience has served her well. Moore is impressive in her vocal performance and arranging on this release. On “Love of My Life,” Moore’s voice melismatically delivers in ranges high and low, while the reverb-drenched background vocals provide a solid accompaniment to her lead. “He Changed Me” is a funky duet between Moore and label-mate Rance Allen, showing that Moore is comfortable in gospel that is both contemporary and traditional. It should not surprise that Moore grew up in a family of musicians who call the church home. Perhaps the only thing stronger than Moore’s voice on Light in the Dark is her faith. The album’s single, “Only God Can,” sings of the power of the Lord, in matters both spiritual and worldly. “All I Can Do is Pray”—released as a single following Moore’s success on Sunday Best and included on Light in the Dark—suggests that praying and patience are the only remedies to the problems of the world. These songs suggest a central message in Moore’s debut: Jesus Christ is, and has been, the source of her accomplishments. Yet, an expression of her faith is not the sole intention of Light in the Dark. The album’s glossy production shows that Moore is centered on a successful commercial career. The majority of the tracks were produced by Pierre “The Maven” Medor—a Grammy-nominated artist working in Atlanta whose résumé includes work with Jagged Edge, Usher, and Mary J. Blige. The album reflects Medor’s experience in contemporary R&B, yet is subtle enough that we never forget: Moore is the leader on Light in the Dark. The singer’s first album is not about breaking musical rules. 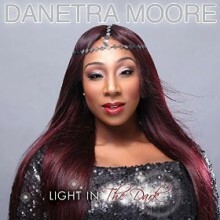 Rather, Danetra Moore’s Light in the Dark is a solid statement by an up-and-coming gospel artist who puts the Lord first, but never loses sight of her personal ambitions. This entry was posted in Gospel Music and Spirituals and tagged Danetra Moore, Light in the Dark by aaamc. Bookmark the permalink.